Fishermen have a lexicon all their own. They drift in their bowpickers on the flats hoping their neighbor doesn’t cork them. What's "corking" you say? Join for Salmon Fishing 101 us as we introduce you to some of the basics of fishing on the Copper River and Prince William Sound. 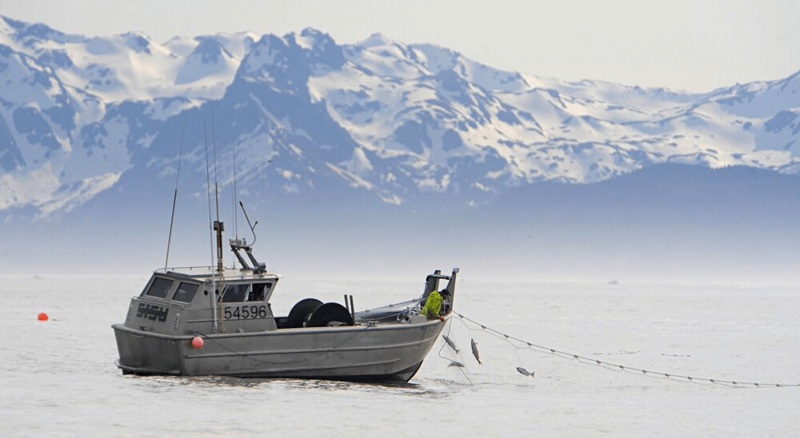 540 or so commercial fishermen catch Copper River and Prince William Sound salmon. These fishermen use nets specially regulated by Alaska Department of Fish and Game to harvest wild salmon from the ocean. Their nets are called drift gillnets. The size of the mesh in the web is regulated to target specific species seasonally. The net is made up of variants of greenish-ocean colored web hung between a line of corks on the top and a heavy weighted line at the bottom. The net hangs vertically in the water drifting with the tide and current while being tended to by a fisherman. Traveling salmon swim into the net without seeing it and are caught by the gills as they try to swim through it. When salmon hit the net the corkline, the line of corks at the surface of the water, bobs and dips. The fisherman will let the net drift for a short period of time if the tide is just right and fish are hitting. The net will be picked up over the bow of the boat and the wild salmon are removed, or "picked", out of the net so the net can quickly be set out again. The net is held on the reel at midship, generally in front of the fish holds. There is a helm, a driving station, inside the cabin as well as out on deck. This allows the fisherman to operate the boat both inside as well as outside. On the bow the bow roller creates a smooth surface for the net to pass through. The harvested wild salmon are stored in fish holds until delivery. The holds are lined with bags to chill and store the fish until delivery. Some boats are equipped with refrigerated sea water (RSW) systems. Some are equipped with slush ice bags and some use flake ice to chill the salmon prior to delivery. The important element is chilling the fish. Proper chilling from the time the salmon is picked out of the net to the time it is delivered to the seafood case at your local market is key to a quality product. Wild Copper River salmon, from our nets to your tables.